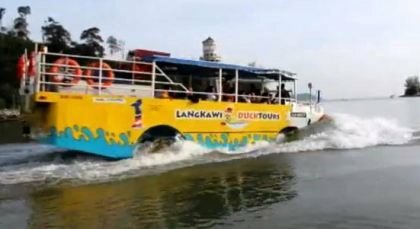 A strange looking amphibious vehicle has been introduced in November 2011 at the Oriental Village (in Pantai Kok area) that looks and acts like a boat as well as a bus. 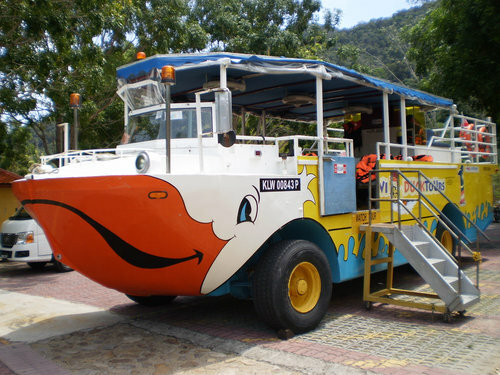 So after the Cable Car Ride from Oriental Village to the top of the mountain Mat Cincang and having enjoyed the views of the islands and sea from the summit, if you want to get a flavor of Langkawi from land and water as well, then the Duck Tour would be a great choice. There are also combo tour packages that include both the cable car ride and the duck tour. The duck tour starts in front of the main entrance to the Oriental Village (Gate A). There is a ticketing kiosk just next to the entrance. When you see the giant and colorful amphibious vehicle parked in front of the gate, you will wonder how this vehicle with large wheels can also float on the water. It can... in facts it plunges into the water with a huge splash and effortlessly moves around in the water. There is a short stairs to climb to get to the deck and take your seat. It's open from all sides, so you get uninterrupted views as it moves. So where does the duck tour take you? The total tour duration is 45 minutes. There are several trips made during the day. It starts as soon as it's full or there are enough passengers on board. Initially it moves on road for about two kilometers from the gate of Oriental Village towards the Telaga Harbor. Along the way it passes by wonderful landscapes of the island and also the famous hotel The Danna. A guide inside keeps giving an audio commentary and narrates background of the places you pass by. Soon you will reach a ramp. Near the entrance of the ramp there is a wooden sign board with an arrow pointing towards the water and saying "Splash Down". The vehicle goes down a ramp and then plunges into the water. This is one of the most exciting moments of the ride as all on board start enjoying aloud as it splashes into the water with a huge thud. Then it moves around in the harbor showing you the marina where large number of sail boats are moored. It's a beautiful view all around with the mountains forming the backdrop. You will be able see many landmarks along the shore and also the artificial Lighthouse from the water. The vehicle also takes you around the Pantai Kok bay. After a while it starts heading back towards the shore and then back to Oriental Village. The duration in water is about 15 minutes. The vehicle does not move fast, it's safe and great for families & children. Open from 9:30am to 5:30pm daily. The tickets are available at the kiosk next to the main entrance of Oriental Village. Adult Ticket: RM38; Child & Seniors: RM22. There is also a family ticket available for two adults and two kids for RM100. 1) Top Langkawi Tours: Many other great tours in Langkawi on land and water.